MONTEREY, California -- The young great white shark that was returned to the wild by the Monterey Bay Aquarium last November died after she was caught in a fishing net off Baja California. 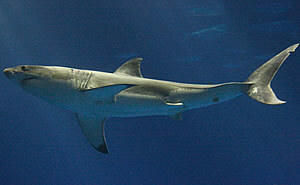 She is the only one of the five white sharks exhibited at the aquarium known to have died following its release. The shark was fitted with two electronic tracking tags when she was released in Monterey Bay, one of which was recovered by Mexican researchers who collaborate with the aquarium to study migrations of young great white sharks. The shark was on exhibit for 69 days prior to her release and traveled about 500 miles south before she was caught in early March, in a gillnet set by a fisherman in waters off Ensenada, Mexico. "This just underscores the threats that these young sharks face in the wild," said Randy Hamilton, vice president of husbandry for the aquarium. "Though they're legally protected in both California and Mexico, they are still caught accidentally by commercial fishermen on both sides of the border. Not all of them survive." "It's very important to know how many of these sharks are being taken, because it has implications for international conservation efforts," said Dr. Oscar Sosa-Nishizaki, a fisheries researcher with the Center for Scientific Investigation and Higher Education (Centro de Investigaci�n Cient�fica y de Educaci�n Superior; http://dob.cicese.mx) in Ensenada. "If we know how many are being caught, we will have a better idea how big a problem this is for the population." Sosa-Nishizaki and his colleagues collaborate with aquarium researchers to tag and track young white sharks in the Gulf of California and on the Pacific coast of the Baja Peninsula, and to collect DNA samples from the sharks. Researchers with the Tagging of Pacific Predators (TOPP; www.topp.org) have published data finding that the northern California great white shark population is isolated from the world's other white sharks; other studies suggest the same is true for the population off Mexico. According to Dr. Barbara Block, a professor of marine sciences at Stanford University and chief scientist of the TOPP program, "Our tagging programs on adults and juveniles along the California coast show that we have several white shark neighborhoods in central California and northern Mexico. Adults from both regions spend half the year foraging around coastal pinniped colonies and the other half far from shore. The juvenile tagging program has helped us to better understand that young-of-the-year pups live close to the coast in warmer habitats, where they're vulnerable to local fishing gear. By learning where they go, we can help ensure their future by establishing programs to monitor these unique populations." TOPP is one of 17 projects of the Census of Marine Life, an ambitious 10-year, 80-nation endeavor to assess and explain the diversity and abundance of life in the oceans. TOPP researchers are tracking top predators that roam the Pacific Ocean � including great white sharks. In 50 years of attempts worldwide, the Monterey Bay Aquarium remains the only institution to keep a great white shark on exhibit for more than 16 days, to get the animals to take food consistently from staff and to document the sharks' successful return to the ocean. Tracking data from four previous great white sharks kept at the aquarium documented their successful return to the wild. Two sharks traveled to the southern tip of Baja California and beyond within 90 days, and a third with a 30-day tracking tag headed to waters near Santa Barbara. A fourth shark, tagged and released near Santa Barbara after 11 days in Monterey, was caught and released in good health just a few days later by a commercial fisherman in Santa Barbara. The sharks have been powerful emissaries for ocean conservation, and have contributed to aquarium field studies of juvenile great white sharks that are adding to the scant knowledge about their life history in the wild. The aquarium will conduct its ninth field season of white shark conservation research this year, in collaboration with TOPP researchers, Mexican colleagues and a rapid response team in southern California headed by Dr. Chris Lowe with the Shark Lab at California State University-Long Beach, and Dr. Chuck Winkler with the Southern California Marine Institute. Because of planned renovations to the million-gallon Outer Bay exhibit, there will be no attempts to bring a young great white shark to Monterey until summer 2011 at the earliest. The exhibit of young great white sharks is part of the aquarium's effort to change public attitudes and raise awareness about the threats facing these top ocean predators. Details about the Juvenile White Shark Project are online, at www.montereybayaquarium.org/whiteshark/. The mission of the Monterey Bay Aquarium is to inspire conservation of the oceans.